Lost Paradise is developed during my residency in Sefrou, Morocco, facilitated by Culture Vulture. Lost Paradise responds to the current urban expansion in Sefrou, a traditional town where is famous for its cheery history. Overlooking this major transformation in landscape and cultural activities, this project suggests the facts of the disappearance of farmlands and indicates the change of labor distribution. The egg carton tower as a symbolic gesture attributes to this change. The cartons are recycled from the egg sellers in medina market. 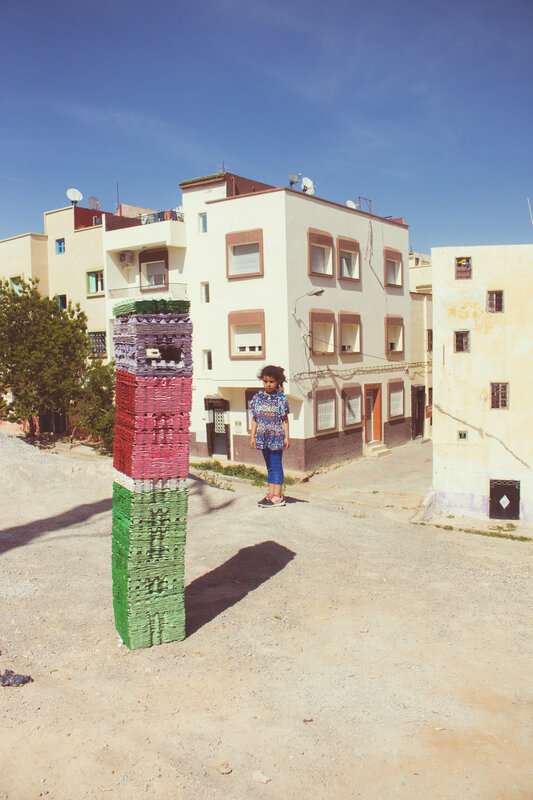 The tower is painted and constructed with local kids as part of community engagement project. As a site-specific sculpture, the tower sits on the edge of old medina, overlooking the new city and an unoperated new market. * To find out more about this project, including research, history of Sefrou, working process and community workshop please visit here.